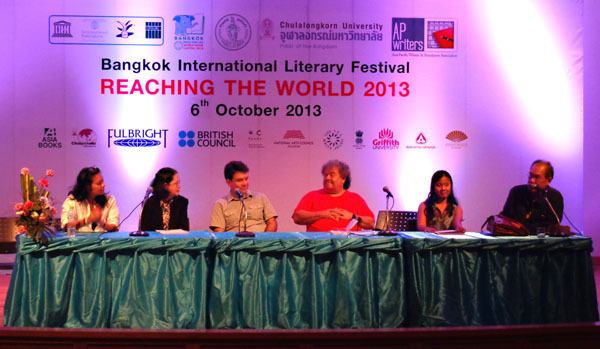 At the 2013 Asia-Pacific Writers & Translators (APWT) Summit, Eliza along with writers Bernice Chauly, Cristina Hidalgo, James Shea, dan Philip McLaren talked on the panel A Writer’s Life. Every Day Creative? This lively session was moderated by author Jose Dalisay, and was held at the Bangkok Arts & Culture Centre, Sunday 6 October 2013. At the 2012 Asia-Pacific Writers & Translators Association in Bangkok, Thailand, Eliza read an excerpt from her then-unfinished novel From Now On Everything Will Be Different. This was the first time she read her work in public, she was so nervous that she almost cancelled her appearance. Yet, immediately after she had finished reading, editors came up to her and asked to see her work. She also talked on a panel on translation, introducing her initiative for literary exchange: InterSastra. Thank you to APWT who, from the beginning of her career, had given her the space and the opportunity to showcase her work.